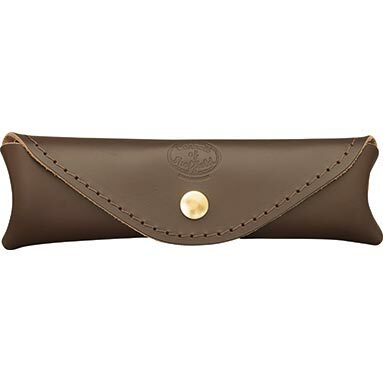 Deluxe Brown Leather Spokeshave Wallet / Holder - 7.5 Inch (Small). Mahogany coloured leather small spoke shave case. Made from top grade, premium quality UK-tanned leather. Stitched with rot resistant, nylon bonded thread. Brass plated, press stud fastening. Dimensions:19cm x 5cm (7 ½" x 2") approx. Made in the UK by Connell of Sheffield. "No hassle" 14 day returns policy - providing the item has not been used.